The Ho Chi Minh City People’s Court on Friday gave death penalty to two former company leaders who were among the 11 defendants in a serious corruption case that caused a total loss of over US$25 million to the State budget. >> Death proposed for 2 corrupt officials This is one of the six most serious corruption cases scheduled to be tried beginning November. The case occurred in 2008-2009 at the Agribank Financial Leasing Company II (ALC II), under the Vietnam Bank for Agriculture and Rural Development (Agribank). 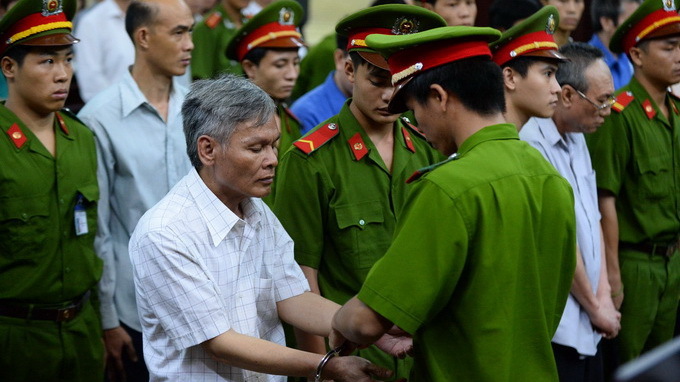 One of the two men sentenced to death is Vu Quoc Hao, 58, the former ALC II general director. Hao was indicted with three charges: embezzlement; abusing his position and power while on duty; and intentionally isolating State regulations on economic management and causing serious consequences. The other is Dang Van Hai, 56, ex-chairman of the Board of Members of Quang Vinh Co Ltd, who is prosecuted for three offenses: swindling to appropriate assets; abusing his position and power while on duty; and intentionally isolating State regulations on economic management and causing serious consequences. The other nine defendants were sentenced from three to 14 years in prison. According to the indictment, Hao used his power and position to sign a number of financial leasing contracts to draw out as much as VND79.9 billion ($3.77 million) for his personal use. He was also alleged to appropriate VND3.9 billion from a contract signed with Anh Phuong Company in southern Dong Nai province. Meanwhile, Hai was found to have stolen 72.1 billion out of the VND373.6 billion granted by ALC II through eight credit contracts. He also extorted VND60.9 billion. The court ordered Hai and Hao to repay VND132 billion and VND80 billion respectively to ALC II. In addition, Hao, Hai and nine other defendants must be jointly responsible for returning VND30 billion to ALC II.